Why I am getting the "Your connection is not private" error screen in Google Chrome? I am using a website that has a https address. You will see the "Your connection is not private" error screen in Google Chrome, because the server certificate provided by the Website you are visiting can not be validated for some reason. www.cacert.org (for example, passwords, messages, or credit cards). 2. Click "ADVANCED" link. You see more information showing up. 3. Click "Proceed www.cacert.org (unsafe)" link at the bottom. You see www.cacert.org page showing up. 4. Open the server certificate as shown in the previous tutorial. You see the server certificate is issued by "CA Cert Signing Authority". 5. Start "Certificate Manager" in Google Chrome. 6. Click "Trusted Root Certification Authorities" tab. You will not find "CA Cert Signing Authority" in the list. So in this case, we are getting "Your connection is not private" error, because the service is using a certificate signed by an unknown root CA. 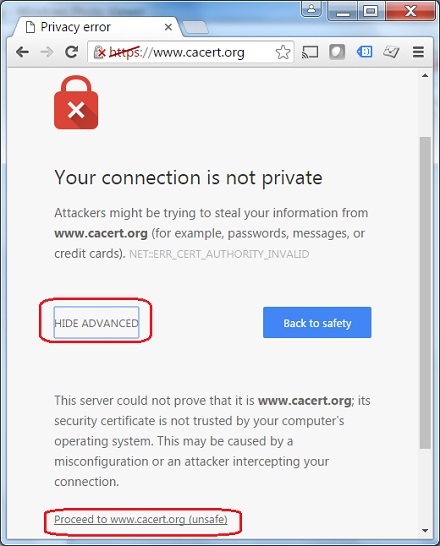 But you can still continue to use www.cacert.org, as long as you trust the group who runs the website. No other people can see your communication data, since the data is still encrypted.